Expands platform to include audit data retention, analysis and investigation across Office 365 Workloads. Makes technical, legal and security audits more efficient. Search Office 365 audit logs by workload, activity, operation, dates and full text search. Quickly find the audit events that matter. Cloudficient™, the Office 365 management solutions provider, today announced the general availability of their Audit and Compliance solution. Designed to increase the efficiency of Office 365 management, the new solution enhances daily troubleshooting together with the execution of technical, security and legal audits. Interactive access to Office 365 audit data greatly assists administration across workloads used by the organization. Core business processes including service desk trouble shooting, compliance and policy enforcement, legal discovery and many other situations depend on efficient access to audit events. 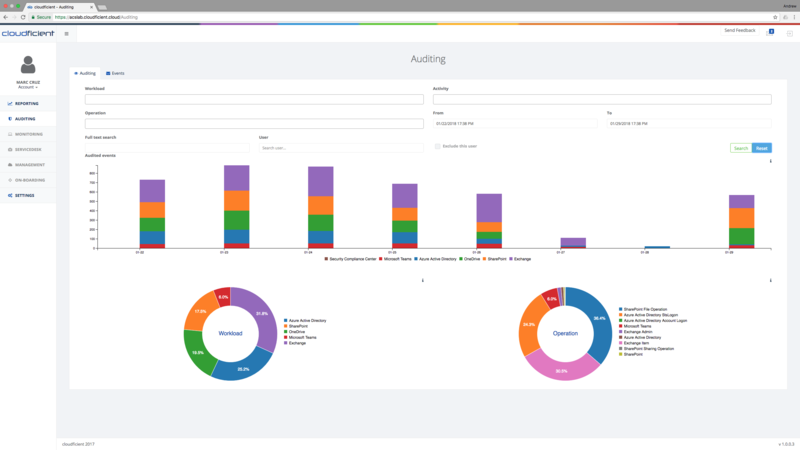 Cloudficient's solution provides a single-pane-of-glass to visualize and drilldown into the details of audit events. Extended storage: Store and analyze audit data beyond 90-day limits. Meet security, legal and compliance requirements and keep your audit data as long as you need to. Powerful search: Search audit logs by workload, activity, operation, dates and full text search. Quickly identify the audit events that matter. Data-grid views: providing advanced filtering of results and export for analysis by other tools if required. Comment and review capability: Add reviewer comments to particular audit events and mark as relevant. Audit snapshots: Create audit report PDFs of search results containing all of chain of custody. According to Peter Kozak, CEO of Cloudficient, "Audit and compliance remains a critical part of Office 365 rollouts. We have added Audit and Compliance to increase the efficiency of IT and security admins, auditors and legal staff. Extensive search capabilities help break through the noise of events to ensure access to relevant information. 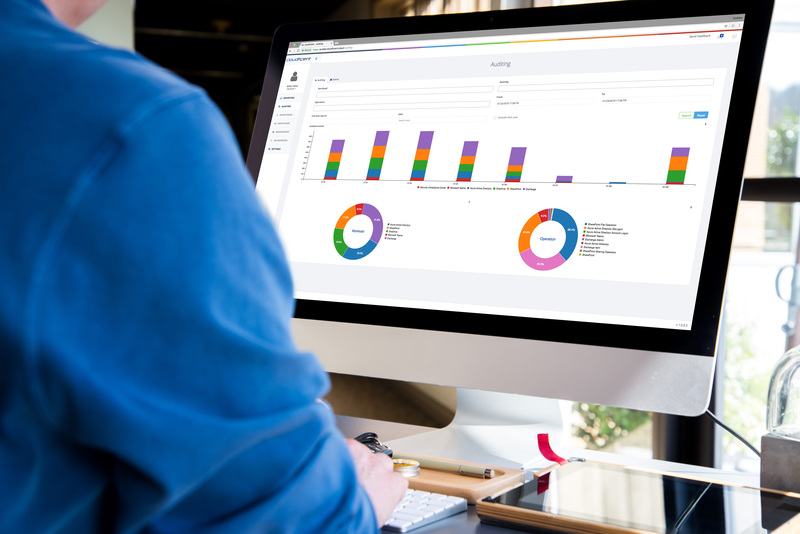 Additionally, and as part of our commitment to bringing AI to the whole spectrum of Office 365 management, our Audit and Compliance tool has been built using the same Cloudficient platform as our free reporting tool." The use of Artificial Intelligence and Anomaly Detection in Office 365 management will allow companies using to manage what they might otherwise miss, without employing additional staff. This focus on efficiency is essential to delivering a high-quality cloud experience. "The Cloudficient platform detects previously unknown situations, enabling them to be acted upon with much greater accuracy and speed." said Kozak. "All the data required will be available immediately for rule or human based action. This proactive approach leads to greater efficiency and will pre-empt many issues, allowing organizations to deliver class leading levels of service, speed of deployment and security." The Audit and Compliance solution is available immediately. Customers are provided with an extended 60-day trial to ensure sufficient data can be collected to make a meaningful decision on value. About Cloudficient: Cloudficient is a privately held company, headquartered in Switzerland, focused on improving the efficiency of Office 365 Management. Our solutions use artificial intelligence and anomaly detection to increase efficiency and lower costs. We provide a revolutionary experience covering whole Office 365 administration, monitoring, reporting and other requirements through a single-pane-of-glass. The Cloudficient founders have in excess of 30 years combined experience in the development of management tools for Microsoft technology. Previous solutions from the team have resulted in improved management of petabytes of email data. Cloudficient is a trademark of Cloudficient Software AG. All other trademarks are the property of their respective owners.